Today was one of those bitter, cold, I want to stay inside kind of days in Maine. So I had a little day dream of one of my favorite places, the West Branch of the Penobscot River. It flows out of Seboomook Lake just north of Moosehead Lake. This section of the river is extremely remote and is accessed by private logging roads from either the Rockwood area or though the Katahdin Region via Millinocket. There is no need to give you directions just pick up a copy of the Maine Atlas and Gazetteer. I never drive into remote sections of Maine without it. Most of the real estate in this region of Maine is owned by large timberland owners who rarely sell, so finding a recreational property to purchase may not be possible. The good news for outdoors people, these owners do allow access to their lands through the North Maine Woods organization with manned gated checkpoints. They will charge reasonable road use and camping fees so have a little cash with you when you enter the woods. Fishing is good for landlocked salmon in the pools below the dam on Seboomook. Be careful wading the river is deep and fast in places. A canoe can be launched and a wilderness canoe trip from here to Hanibal's Crossing on the Golden Road would make for a great outing. From the crossing the West Branch flows though remote forest to Chesuncook Lake where moose and deer are more plentiful than people. Expect to see them wading in the shallows around a bend in any of the slower river sections. The next section of the West Branch begins at McKay Station below Ripogenous Dam. This is the most popular and busy section of the river. This is where many white water rafting and kayaking enthusiasts begin their journey. This is no place for a canoe! Fishing is possible around the power station and occasionally a lunker landlocked salmon is caught here. The whitewater begins immediately below the station and is an exciting experience if you are brave enough to give it a try. The steep canyon walls and rapids through this section make fishing difficult to impossible. The water flattens out briefly at Little Eddy and can be fished from shore with careful wading or from a canoe. 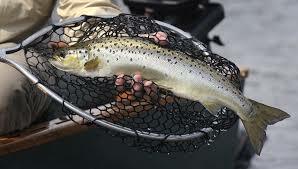 This is fly fishing only water from the dam to the bridge at Telos Road and the landlocked salmon need to be 26 inches or longer to be kept with trophy fish caught every year. The West Branch from Rip Dam to Ambajejus Lake is probably the most scenic section of the river with Mount Katahdin towering above it. The gorge near the dam has a rough trail along the north river bank. Great views of the river and its steep canyon walls along this trail make it worth bringing your camera. Paddlers will be challenged by some of the most technical whitewater in Maine with some class 4 and 5 rapids just before the Big Eddy. There is a wilderness campground run by the Chewonki Foundation at the Big Eddy. This can be accessed by car from the Golden Road out of Millinocket. The campground has plenty of sites for campers, tents and a few cabins are available. You can also get a hot shower if you have been in the wilderness for several days. Below the Big Eddy a series of rapids and dead waters meander through the woods before the river flows into the Pemadumcook Chain of Lakes at Ambajejus Lake. Along the way you pass the southern boundary of Baxter State Park, the Appalachian Trail and many good camping spots. Leaving the lakes at North Twin Dam, the West Branch flows through a series of ponds and dams, around the town of Millinocket and East Millinocket eventually meeting the East Branch to form the main stem of the Penobscot River in Medway. The adventurous angler will enjoy some secret landlocked salmon spots and truly remarkable smallmouth bass fishing in the small stump filled ponds. Come to the West Branch this year and enjoy the outdoors. A couple of notes before you get here. The upper river water levels can change quickly below the dams so use caution when wading the river. The State of Maine has a ban on transporting firewood in hopes to stop the spread of invasive insects like the Emerald Ash Borer and others. Do us a favor and buy your campfire wood at the camp sites. Finally, if you are bringing a boat and motor and waders, be sure to property clean them to prevent the spread of invasive plants and organisms. Maine has been fortunate to avoid many of the pests that have plagued other areas of the U.S. If you are new to the area and want an expert to show you the river and other secrets of this part of Maine, click HERE to contact our favorite Master Maine Guide.